SCIENCE CODEX summarizes and links to a report by the American Association for the Advancement of Science: Widespread looting and damage to historical sites in Syria. Four of six major archaeological sites in Syria have been heavily looted and damaged, according to an analysis of high-resolution satellite images that documents the extent of the destruction. The report analyzes six of the 12 sites that Syria has nominated as World Heritage Sites: Dura Europos, Ebla, Hama's Waterwheels, Mari, Raqqa, and Ugarit. Images from 2014 show numerous pits throughout three sites where ancient cities once stood. The pits generally do not appear in similar images from 2011, when the conflict in Syria began. Background here and here and links. NEW NOVEL: Op-Ed: Book Review: "Shimon", the Story of a Talmudic Giant. A book about a gladiator turned Talmudic Sage, which inadvertently shows the greatness of the Torah's attitude to human failings (Rochel Sylvetsky, Arutz Sheva). "Shimon" is the story of the life of third century Talmudic scholar Resh Lakish, whose real name was Shimon ben Lakish, gleaned from the few fascinating episodes about him as related in the Talmud. John Steinberg has used the few available personal glimpses of Resh Lakish's biography to create an historic novel that brings to life the period of cruel Roman rule over Jews struggling to preserve their society intact, skillfully employing much literary license to fill in the story of an unusual man who set his stamp on the Talmud. BIBLE HISTORY DAILY: Top 10 Biblical Archaeology Discoveries in 2014 (Robin Ngo). This translation — the Septuagint — eventually became the basis for the Old Testament section of the Christian bible a few centuries later. The Greek translation of the Bible also further aided the advance of the agenda of the Hellenist Jews to bring Greek culture into Jewish life, and to attempt to reform Judaism in the image of Greek values and lifestyle. The “koshering” of the Greek language by its use in translating the Hebrew Bible had wide ramifications in Jewish society and undermined some of the efforts of the rabbis in combating the allure of Greece in Israel of then. Unfortunately, the article gives no specific Talmudic references. The Tenth of Tevet was on New Year's Day 2015. ANOTHER LOOTING ARREST: Antiquities thief busted with over 800 ancient coins. Beit Shemesh man caught while prowling archaeological site with metal detector; found to have immense trove of currency, necklaces, seals, arrowheads and more at his home (Ilan Ben Zion, Times of Israel). Hundreds of ancient coins and ancient artifacts were found at the home of a suspected antiquities thief in Beit Shemesh last week after the man was caught in the act at a nearby archaeological site, the Israel Antiquities Authority announced Wednesday. There has been a number of looting arrests in Israel recently. HAPPY NEW YEAR to all those celebrating! Probably everybody. Many of you have already seen this, but here's something just for fun. Very clever, even though most biblical philologists have no problem with "liberals" or Finkelstein. He was full as a Pickford's Van. Best wishes for 2015 and, as always, keep reading PaleoJudaica. The Book of the Life of Jesus (in Hebrew Sefer Toledot Yeshu ) presents a "biography" of Jesus from an anti-Christian perspective. It ascribes to Jesus an illegitimate birth, a theft of the Ineffable Name, heretical activities, and finally a disgraceful death. Perhaps for centuries, Toledot Yeshu circulated orally until it coalesced into various literary forms. Although the dates of these written compositions remain obscure, some early hints of a Jewish counter-history of Jesus can be found in the works of Christian authors of Late Antiquity, such as Justin, Celsus, and Tertullian. Around 600 CE, some fragments of Jesus' "biography" made their way into the Babylonian Talmud; and in 827, archbishop Agobard of Lyon attests to a sacrilegious book about Jesus that circulated among Jews. In the Middle Ages, the book became the object and tool of an acrimonious controversy. Jews, Christians, and theists, such as Ibn Shaprut, Luther, and Voltaire, quoted and commented on Toledot Yeshu , trying to disprove the beliefs of their opponents and revealing their own prejudices. The narrative was translated into Latin and many vernacular languages and soon branched into numerous versions with only a few basic facts in common. The present publication provides researchers with reliable conclusions regarding the narrative's origin and evolution. In addition, the purchase of the volume offers full online access to a comprehensive database of Toledot Yeshu manuscripts, designed to encourage and facilitate further research about this important book in the history of Jewish-Christian polemics. All Hebrew and Aramaic manuscripts are edited in the present book and database: an unusual combination of a traditional critical edition with an electronic research tool. The database features a full-text search of all manuscripts as well as printing and downloading capabilities. The price includes access to the database (for one simultaneous user). Access for institutions is provided through the IP address, for private individuals through username and password. An activation code is enclosed in the book. Access to a free seven day trial period can be obtained here: toledot [AT] mohr.de . Also, related, at the Jesus Blog: Mika Ahuvia on Toledot Yeshu. Philology—the discipline of making sense of texts—is enjoying a renaissance within academia after decades of neglect. World Philology charts the evolution of philology across the many cultures and historical time periods in which it has been practiced, and demonstrates how this branch of knowledge, like philosophy and mathematics, is an essential component of human understanding. Every civilization has developed ways of interpreting the texts that it produces, and differences of philological practice are as instructive as the similarities. We owe our idea of a textual edition for example, to the third-century BCE scholars of the Alexandrian Library. Rabbinical philology created an innovation in hermeneutics by shifting focus from how the Bible commands to what it commands. Philologists in Song China and Tokugawa Japan produced startling insights into the nature of linguistic signs. In the early modern period, new kinds of philology arose in Europe but also among Indian, Chinese, and Japanese commentators, Persian editors, and Ottoman educationalists who began to interpret texts in ways that had little historical precedent. They made judgments about the integrity and consistency of texts, decided how to create critical editions, and determined what it actually means to read. Covering a wide range of cultures—Greek, Roman, Hebrew, Arabic, Sanskrit, Chinese, Indo-Persian, Japanese, Ottoman, and modern European—World Philology lays the groundwork for a new scholarly discipline. PUNIC WATCH: BMW i3, i8 take on 2014 Hannibal Tour (Wheels24). THE TELEGRAPH: The online battle for papyrus texts. Papyrus scrolls are also now increasingly desirable items in the distinctly 21st Century world of the online auction trade, writes Philip Sherwell. They are tattered yellowing fragments of bygone civilisations, ancient manuscripts that open a remarkable window on previous millennia, including the earliest days of Christianity. But papyrus scrolls are also now increasingly hot items in the distinctly 21st Century world of the online auction trade. When a fragmentary parchment sheet from the 3rd century AD featuring portions of Paul’s epistle to the Romans was bought at Sotheby’s for £301,000 auctioneers and antiquity experts alike were stunned. But although there is no suggestion of any impropriety in these particular sales, scholars are alarmed by the burgeoning online trade as some unscrupulous sellers also cash in. They portray a free-ranging trade, particularly on the online auction giant eBay, where precious documents are carved up for sale, potentially stolen goods are trafficked and forgers can flourish. Brice Jones, a papyrologist and lecturer in New Testament and Early Christianity at Concordia University in Montreal, has become an online scrolls sleuth, scouring auction websites for manuscripts that are often incorrectly labeled or their provenance unclear. I have linked to Brice C. Jones with reference to such matters here, here, here, and here. For a somewhat different view on the Green Collection, see the comments of Roger Pearse noted here. The article also mentions the sad (in different ways) stories of The Gospel of Jesus's Wife and The Gospel of Judas. CONGRATULATIONS TO LARRY HURTADO: Mark, Manuscripts, and Monotheism (Festschrift for Larry Hurtado) (Tommy Wasserman, ETC). ALIN SUCIU: Two Positions Available in the Project “Digital Edition and Translation of the Coptic-Sahidic Old Testament” (Göttingen Academy of Sciences). Closing date: January 20, 2015. More on the project here. PRESS RELEASE: SDSU Jewish Studies program tells 2015 plans. • Dead Sea Scrolls: The Exhibition, curated by SDSU’s Jewish Studies Program Director, Dr. Risa Levitt Kohn, opening March 10, 2015 at The California Science Center in Los Angeles. This traveling exhibition, different in content and design than the San Diego show of 2007, opened in New York City in 2011 and has been on display in Philadelphia, Boston, Cincinnati and Salt Lake City. The exhibition features over 600 objects, including ten Dead Sea Scrolls and is the largest collection of Israeli archaeological artifacts ever exhibited outside of Israel. I have been following the peregrinations of this exhibition for years. Background here and many links. I reviewed the 2007 exhibition of the Dead Sea Scrolls in San Diego here. CULTURAL ICON WATCH: NMH exhibit to feature Taoist artifacts (Taiwan Today). A total of 183 artifacts depicting the history of Taoism are to be displayed in a special exhibition at the National Museum of History Dec. 20 to March 29, 2015, in Taipei City. Another highlight is a collection of the oldest extant bamboo slips quoting Lao Tzu, which date to the Warring States Period (476-221 B.C.). 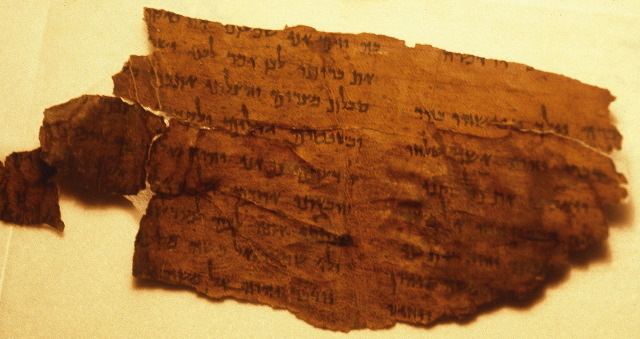 The equivalent for Taoism of the Dead Sea Scrolls to the Hebrew Bible, the slips have never before left mainland China. “The unearthing of these bamboo slips proves the existence of Lao Tzu the person and his thought,” Wang [Jichao, head of the exhibition department of the Hubei Provincial Museum,] said, explaining the significance of the texts. Sort of. In fact the name Lao Tzu means "Old Man," which may in this context just mean "Wise Philosopher" rather than a proper name, so the work may be anonymous. It would be clearer to say that these manuscripts show that the literary work called "Lao Tzu" (better known as the Tao Te Ching) does indeed go back to the Warring States Period. Now this has nothing to do with ancient Judaism, except as an interesting parallel discovery in China. I note it mainly because of the comparison with the Dead Sea Scrolls, which, at least in the West, serve as the template for a momentous discovery of ancient manuscripts. A decade ago I noted and discussed a similar manuscript discovery in China as an example of the Dead Sea Scrolls as cultural icon. BIBLE HISTORY DAILY: Digs 2015: Blast from the Past. Read the full article from the January/February 2015 issue of BAR (Megan Sauter). BAR’s January/February issue—known as the “Dig” issue—has been highlighting excavation opportunities for the past 40 years. This year, in addition to sharing reports and images from the 2014 excavation season, we checked in with individuals featured on the cover of past “Dig” issues, along with some BAS scholarship recipients, to see what they’re doing now. Read their updates, enjoy essays from this year’s BAS scholarship winners and explore excavation opportunities in 2015 with our annual dig guide.